Sitting on a bar stool right across the floor. I relax to scheme a little. A single malt whisky smoking before him. I relax to dream a little. Slip it onto my ring finger. Rush to set me free! A man in control of my destiny. The profile of a queen, in reprieve. He holds me in languid embrace. She’s ready with my rebuff. I feel the anger from being ignored. “Mmmm,” the bar man echoes. An involuntary breath escapes my lips. She fights hard to hold her zeal in check. The element of surprise is advantage. A man ready to accept his due. For one brief eternity, he hesitates. She looks even hotter from behind! ametuliz kwa stool ya bayesa tu na usuko. msexe, hana hype, msupa, wa kukwachu. hi rysto itatake ithaa gani jo? tueye lashes tudark tumering mboni zake. mse mpoa wa kudistinguish blood line nguyaz. 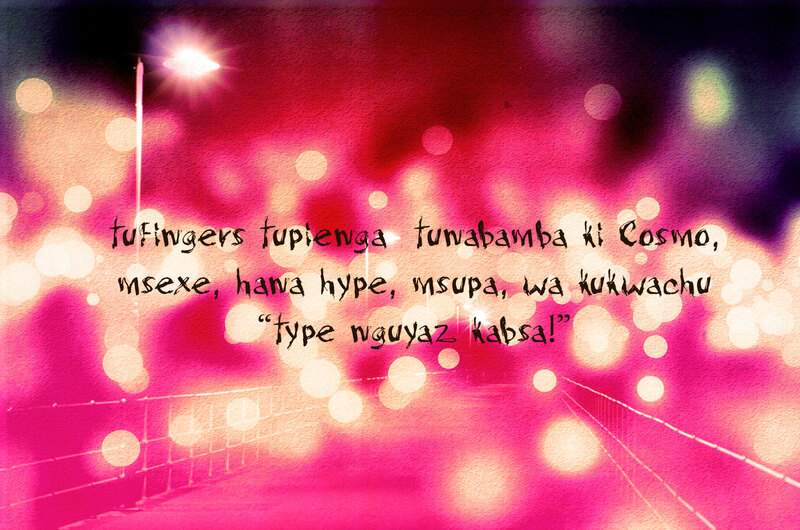 nachuck ring ya ugoro fake kwa poke. u madam macosmo atakwom kuniokolea. naskia kusmile, toka head mpaka toe. arms zake zinasway, R n B.
mse ana destiny nguyaz in control. mirror yam see wa bayesa inamsho akinikiche. lips zake wet zinaopen kurongesa. nakula moto juu ya kulengwa. si must nibonge, lakini nita. bro anaside na mchizi wake. “mmmmm,” mse wa bayesa anasay. namesea by hii ithaa anavuta pumz. ako ready nimwingize box yangu yote. breath sijachorea inahepa lips za mine. jipa shugli na madetailz zimesundwa. anaseti kibagiko kibigi kwa shoulder yake. anaswing leg long toka kwa stool ya bayesa. mse ready kuaccept hustle yake ijipe. na turn left, side ya door. sweat cold inabreak in pin pricks kwa uso nguyaz. For sake ya heaven bana! Ni mhot kuruka, kwanza kutoka manyu! nahisi hasira sababu yakupewa mgongo. Yuapendeza hata zaidi ukimtazama kutoka nyuma! Sitawa Namwalie is a Kenyan poet, playwright, writer and performer. In 2008 she staged her first dramatised poetry show “Cut off My Tongue,” which was later published in 2009. “Cut off my Tongue” has toured several countries including, Kenya, the UK, Uganda and Rwanda. In 2010 “Cut off my Tongue” was selected by the first East African Sundance Lab. In 2011 her second show; “Homecoming” was performed in Nairobi. In 2014 she won Kenya’s Sanaa Theatre Awards for Best Spoken Word and Poetry for “Silence is a Woman”. Sitawa is based in Nairobi and works as an international consultant. L-ness alias LIONESS aka Lydia Owano Akwabi is one of East Africa’s top female Emcees. She has performed alongside other artistes at Hip Hop Halisi, Jukwaani, WAPI, Translating Hip Hop, Afreekah Album launch, Alfajiri Album launch and the African Hip Hop Caravan shows. She released the albums Simangwe (2011), Gal Power (2012) and Punch (2013). L-ness facilitates workshops on hip hop culture, roots and traditions. She completed a documentary on the growth and development of hip hop in Nairobi alongside TUMI, a South African MC from Johannesburg.